Hushabye are owned and manufactured by the Airsprung group of companies that include Airsprung, Windsor and Gainsborough and also Swanglen headboards. The Hushabye mattress range is wide and varied and offers good quality coil spring mattresses that will rival Myers as well as pocket & memory mattresses that will offer better value than Silentnight or Rest Assured. As well as these mattresse... Read more >s Hushabye offer a range of traditional pocket spring mattresses with luxury natural fillings. The top of the range mattress is the Insignia which is available in medium or firm, as is the Berkeley 1700 or ascot 1400. 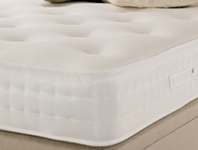 Hushabye also offer a 1200 and 1000 pocket spring mattress called Westbourne and Cambridge that are available in soft, medium, firm and extra firm tension and all mattresses come with a 5 year warranty.